Miguel de Lancastre e Tavora was a master rider, trainer, and instructor. His genuine love and care for the well-being of horses come through on every page. His Kind, calm, and methodical approach is laid out in a progressive sequence that adheres strictly to the principles of the FEI. “This is a workbook, a blueprint for the serious rider. After the training sessions I had with Miguel—when I was back home riding, I suddenly had a whole new vocabulary of school movements, of techniques to apply. “Just as every training session with Miguel developed gently, logically, each step, each exercise building on the last, so too this work. 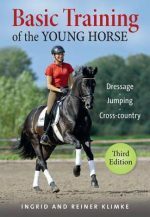 I know of no other book in the English language that provides such sophisticated and detailed prescriptions for horse and rider as they move to the ultimate goal: collection, and horse and rider as one. “So much of the ‘dressage’ we see in the competition ring is distressing to watch. Riders leaning back, rudely, crudely pushing their horses into hard and unyielding hands. Is it any wonder that their horses go hollow, shorten behind, and wave their front legs in an extravagant manner that fools only the ignorant? Sadly, this group includes a number of five-star international judges. “What I find so puzzling is that this style of training not only produces such a sorry result, but it is so taxing on both horse and rider. The rider must ride the whole time in a state of tension, to balance the tension he has provoked in the horse. It is oh-so-different when I watch Miguel work with one of his talented pupils. Here the rider is relaxed and soft and the horse willingly gives his back. As the exercises progress, the horse and rider move into a balance that is as beautiful as it is functional.